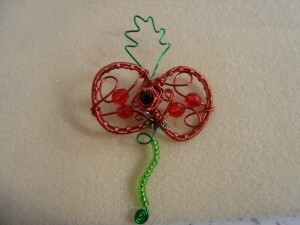 A Telford jewellery maker has raised nearly £80 for the poppy appeal by selling handmade wirework poppies. Lesley Parr, who owns Lesley’s Jewellery Box in Oakengates, was asked to make a poppy for one of her friends just over a week ago. Her friend loved it so much she posted a picture on Facebook and her friends started asking for them too. She has sold a total of 31 of the £5 poppies – each one taking about an hour to make – raising £77.50 for the poppy appeal.